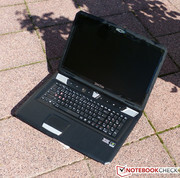 Hell 3.0 - A year back, the reasonably priced Deviltech Fragbook performed really well in our review. Now the device is available with Ivy Bridge processor technology and the GeForce GTX 675M. It has some really powerful rivals to overcome. We will evaluate if this laptop will prevail over the competition. 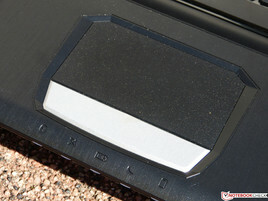 At the end of last year, the German hardware manufacturer Deviltech brought their Deviltech Fragbook out on the market. The benefits of this were obvious: Gamers could configure the device themselves through the online store, while enjoying devilishly good prices. The company was asking for only 1235 Euro (~$1600) for the notebook. Today we are testing the device under the same name but with the inclusion of the Intel Core i7-3610QM, a processor from the Ivy Bridge generation. Together with the Nvidia GeForce GTX 675M and 8GB DDR3 RAM, decent gaming performance should be achievable. But the competition is will put up a good fight. 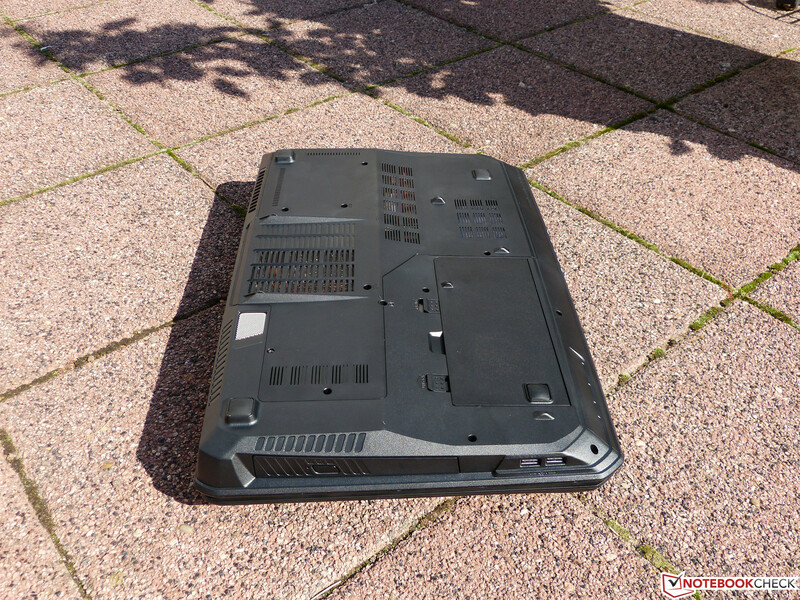 Medion's Erazer X7817 with its good screen, fine hardware features and a slightly weaker graphics card comes with a price tag of around 1150 Euro (~$1500) which makes it one of the front runners for a decent gaming system. And there is also competition from the same country, namely Schenker, which offers the XMG P712-1AM Pro for 1400 Euro (~$1800), which is a very similarly featured device with the same CPU and GPU. 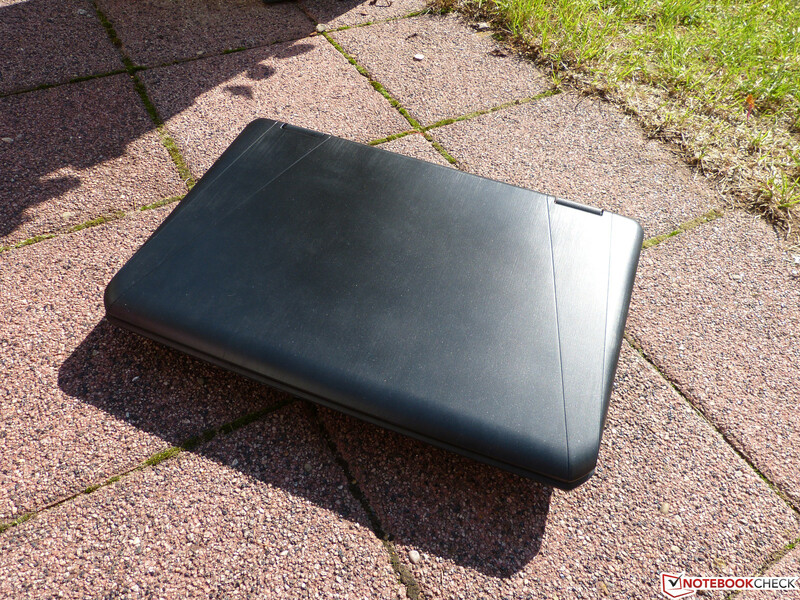 And finally, you have One GameStar Notebook Pro 17 from a publisher of gaming magazines, GamesStar that offers the machine for about 50 Euro less. So the question if the Deviltech product is relevant in the face of such competition and still appeal to the consumer. 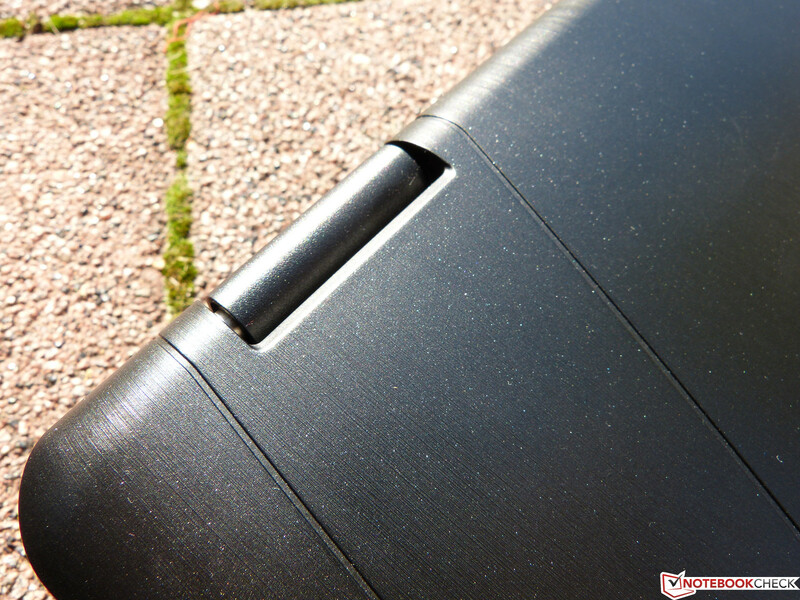 Experts in the mobile gaming sector are familiar with the case of the Deviltech Fragbook: This is a barebone from MSI, which is used for a variety of other notebooks from various manufacturers. It is not surprising to find that GameStar is also selling notebooks using the same platform. The MSI MS-1762 is also used in the Medion Erazer X7817, the MSI GT70 and the One M73-2N and for this reason, we are going to be brief on the case. While the overall look does appear quite cheap due to the almost continuous use of plastic, it does allow for some small design elements such as the silver speakers and the on/off button which try to break the monotonous pattern. Around the display and the keyboard you will unfortunately find a piano-black surface finish, which gathers fingerprints and becomes extremely difficult to keep free off fingerprints. In terms of stability and workmanship, the barebone is convincing for the most part. 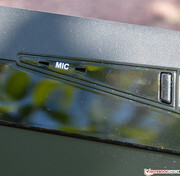 One exception may be found with the power buttons where the case can be easily deformed. Furthermore, the display lid can not really be called rigid. As in other reviews, we eventually end up praising the overall matte black case, which (aside from the piano finish elements) doesn't give fingerprints a chance. Between the pair of silver speakers you will find a whole row of touch-sensitive buttons which offer a diverse range of functions from fan-boost to opening the DVD-RW optical drive. Admittedly, the buttons are to some extent confusing like in the case of the button for activating the WLAN reminding us of the GPS symbol on some mobile phones. We would recommend that you try it out and get used to it. 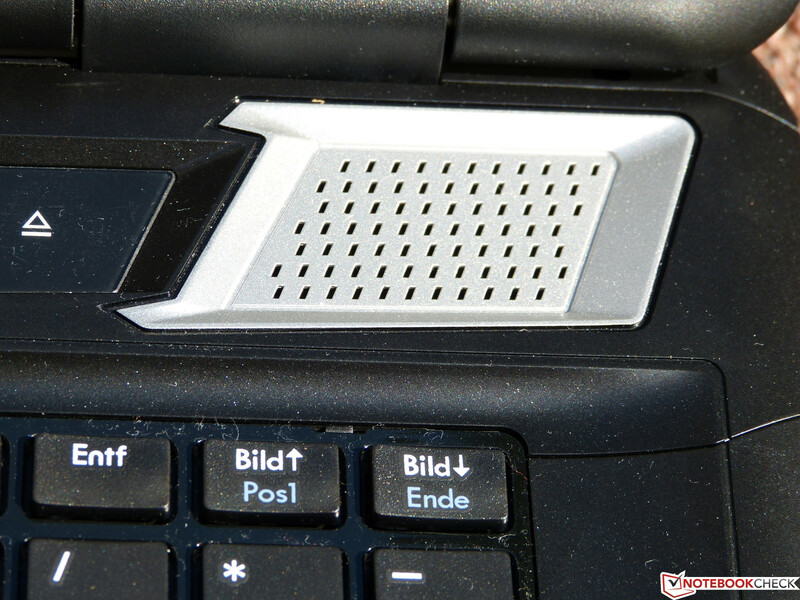 What should still be noted however, is the button for the so-called "CoolerBoost" which makes the fan run at full speed, even if the notebook is under minimal stress. This is of course to cool down the case during instances of gaming that overloads the system and generates a lot of heat. 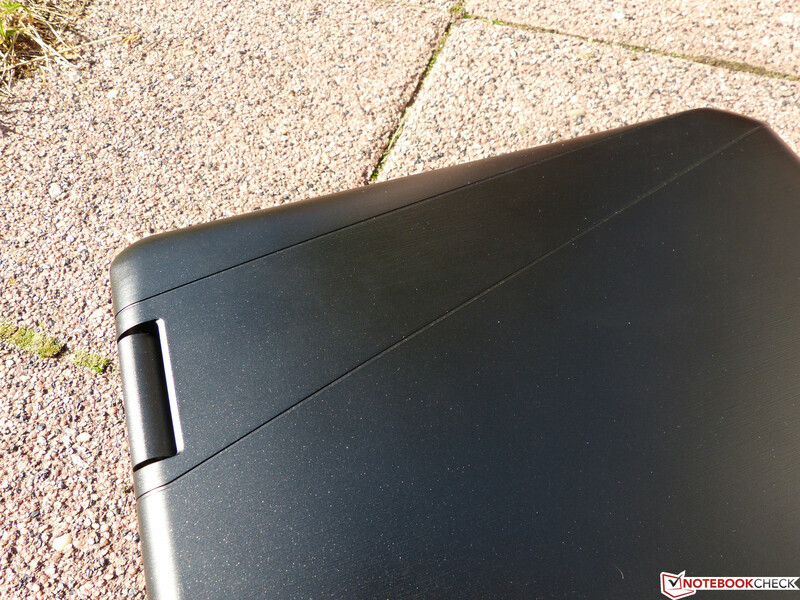 The workmanship can be considered decent with only the keyboard area showing some assembly issues in the form of a noticeable gap in its seating position with the frame. The notebook (including the battery) weighs 3.655 kg (~8.06lb.) 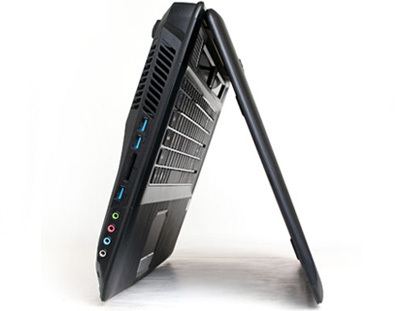 which is typical for a gaming notebook of these proportions. The Deviltech Fragbook isn’t really meant to be moved around. At LAN parties and similar events the troublesome weight is around a kilo to heavy. You can never forget the gigantic power adapter that powers this gaming machine. The notebook itself is anything but compact, with the thickest part of the case measuring 4.4 cm (~1.7 in) high which makes the search for a matching backpack a little more difficult. All of these disadvantages are naturally something that all gamers have to deal with when buying any ‘gaming notebook’. 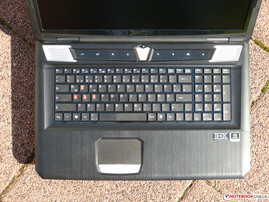 The connectivity is similar to the previously mentioned notebooks. On the right side you find two USB 2.0 ports next to the DVD optical drive which i beneficial for a right handed mouse user. 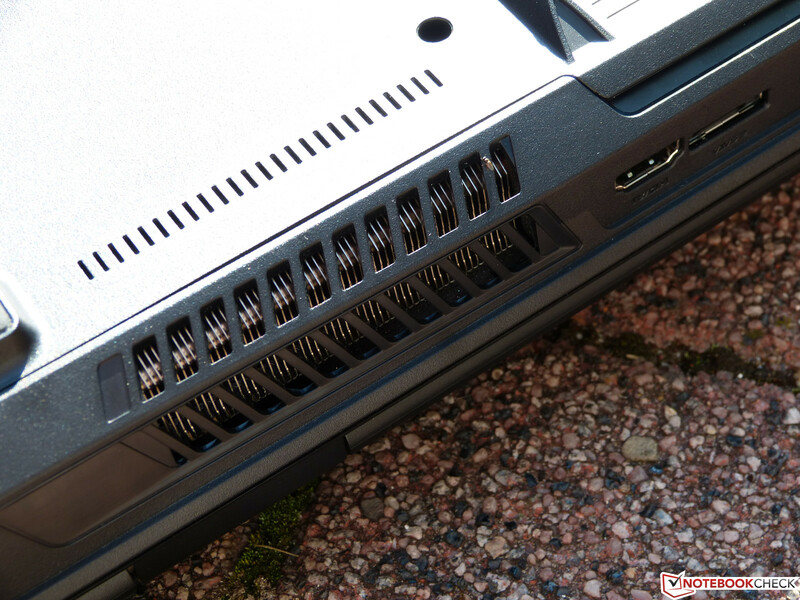 The back side includes some of the bigger and bulkier ports such as the HDMI and VGA connectors which allow you to run external displays. Furthermore, the power cable is also plugged in here. A little more to the left is a slot for a Kensington Lock. 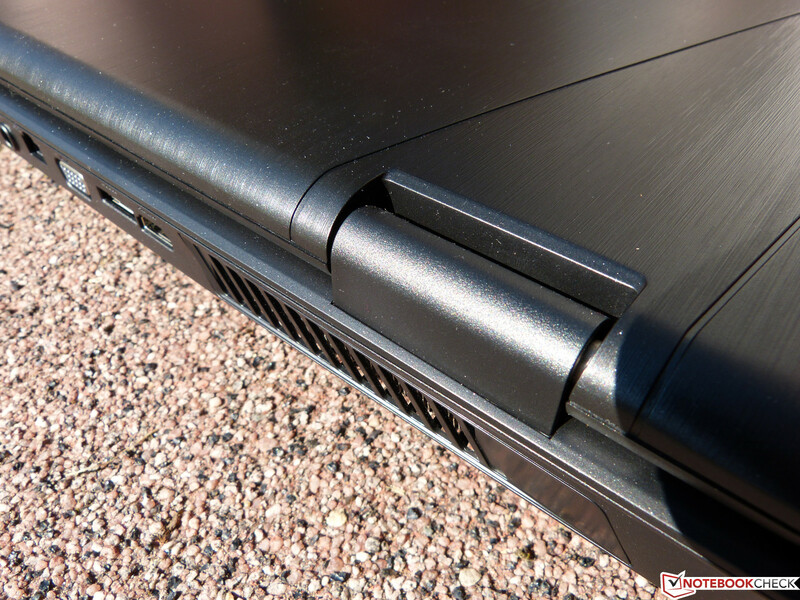 Next to these ports you will also find an eSATA port which allows for fast data transfers with external hard drives. At last is the RJ45 jack which has also found its way onto the back of the notebook. 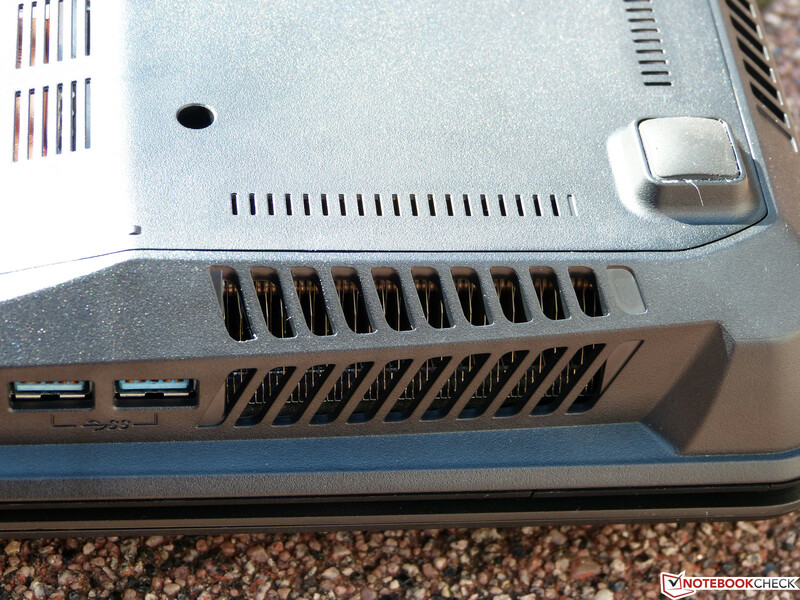 The left side is populated by two USB 3.0 ports next to the fan vents, a 4-in-1 card reader as well as another USB 3.0 port. 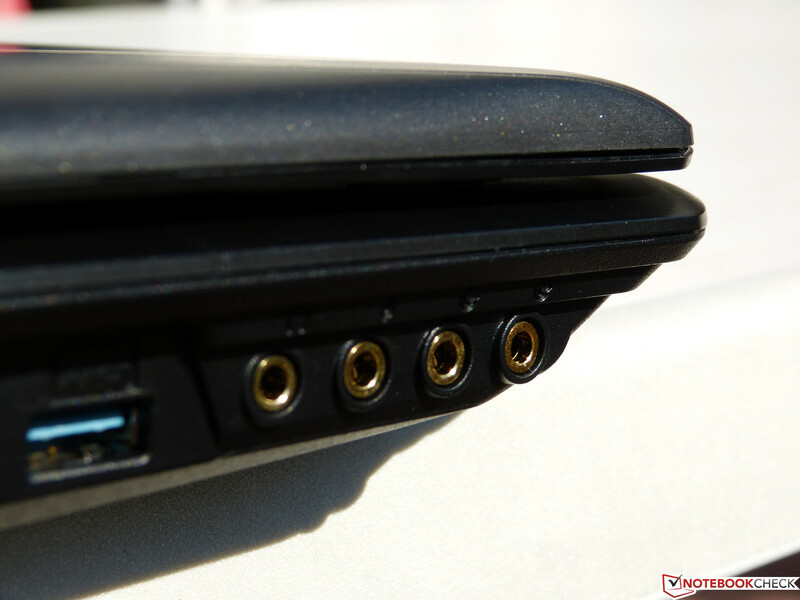 Furthermore, a total of four jacks are available which could be used to run a 5.1 audio system. With the large number of USB ports, there shouldn't be any problems connecting a number of peripherals. 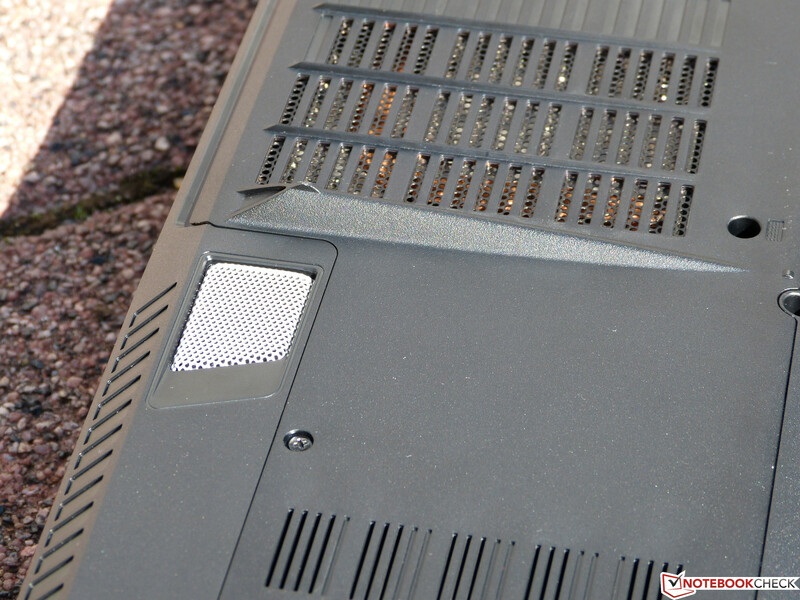 Because of how the bigger connectors have been placed on the back side, space is saved and potential problems cable clutter have been avoided. Overall, the cable and connectivity management is smart and well thought out. Even left hand users should have little problem using an external mouse. It goes without saying that no average 0815 network card is going to be employed on a gaming notebook. So Deviltech has settled on the Qualcomm Killer e2200 Gigabit Ethernet Controller which should reduce latency and promises superior multiplayer gaming performance. 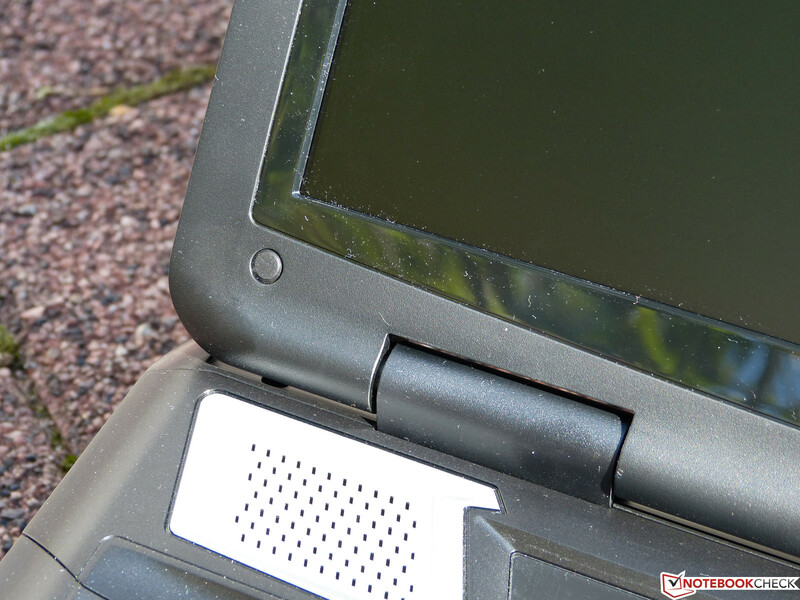 The notebook connects wirelessly via Intel Centrino Wireless-N 2230 and we couldn't identify drops in connection or other problems. A built in WWAN card is something gamers won't find due to the weight and the size. It would be unnecessary as the laptop is not meant to be mobile. In terms of accessories, Deviltech luckily doesn't hold back. You will find a Quick Start Guide along with a classic driver DVD in the box. This is especially helpful with a new installation of the operating system, meaning you do not have to manually search for all drivers online. Almost all bloatware (add on programs installed from the start) have been done away with which is a positive for the customer who can enjoy the their new notebook without having to uninstall various demo and trial programs or effectively reinstalling the operating system. 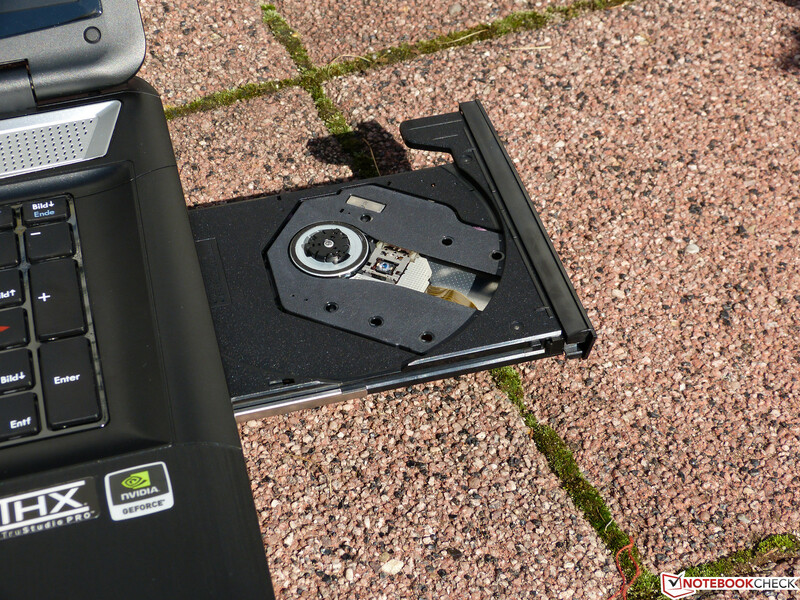 One particular tool that is installed and is actually rather useful is the S-bar on the hard drive which allows for quick access to certain settings. Because the case is much used and especially well known barebone from MSI, the maintenance and parts replacement could never be this good. 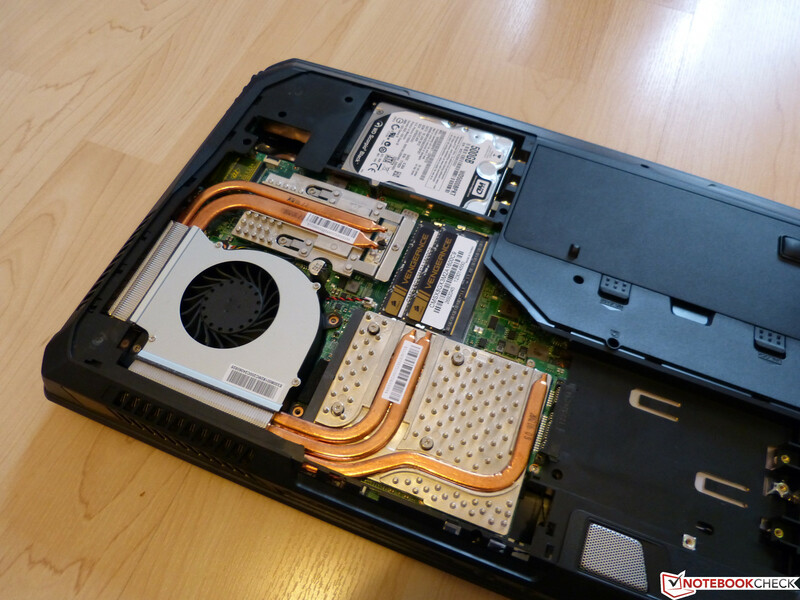 If the 7 screws from the under side of the notebook are removed, the panel can then be taken off to allow access to the CPU, GPU, RAM slots and also the two slots for hard drives. One of the two hard drive bays is free, meaning that you could install your own SSD or another standard hard drive here. Deviltech ships the Fragbook standard with a warranty for 24 months. This can be extended to 3 years for another 100 Euro (~$130). Further options such as theft insurance are not offered on the website and are therefore not available for purchase, meaning that it would have to be done privately. 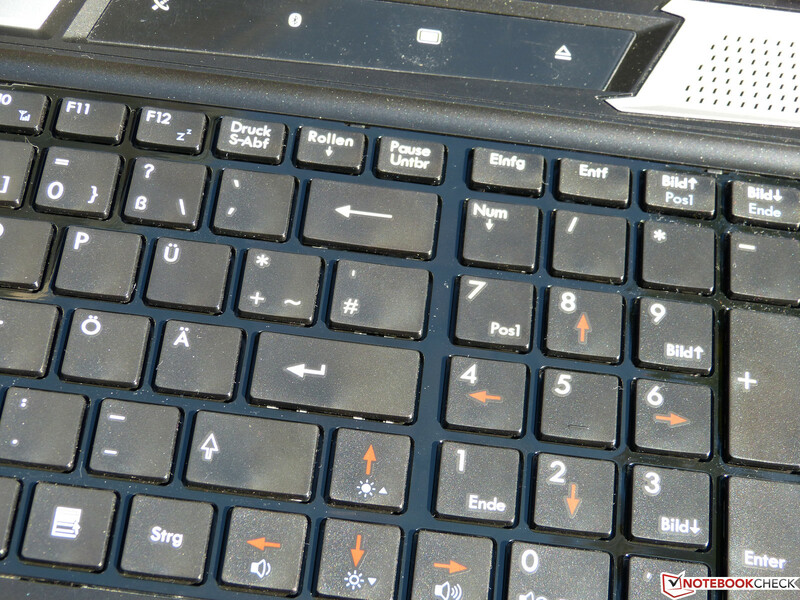 The Barbone from MSI uses a Chiclet-style keyboard. 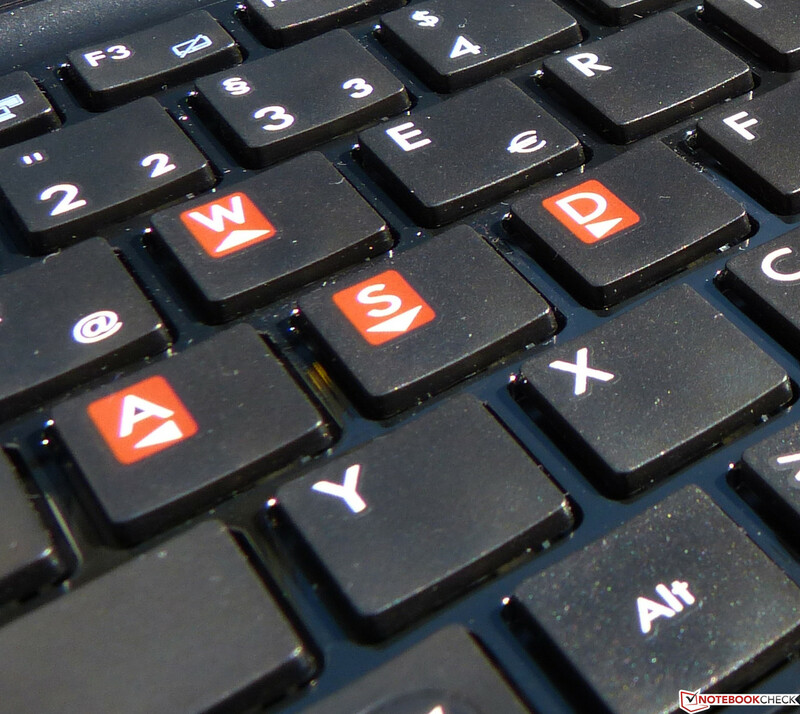 It is characterized by a relatively firm keystroke and a clear pressure point which are actually good qualities for frequent typists. Unfortunately, it's using the 15-inch version of the keyboard which has then been transferred onto the 17-inch case of the Fragbook. Therefore, the layout has been unnecessarily squashed resulting in some keys having to be altered for the worse. 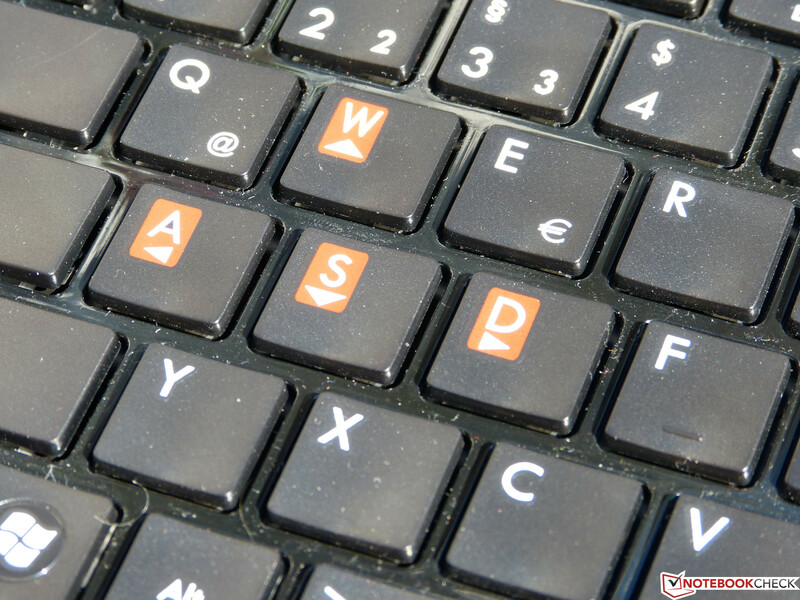 The hash key is now found over the enter key which now only occupies one line. 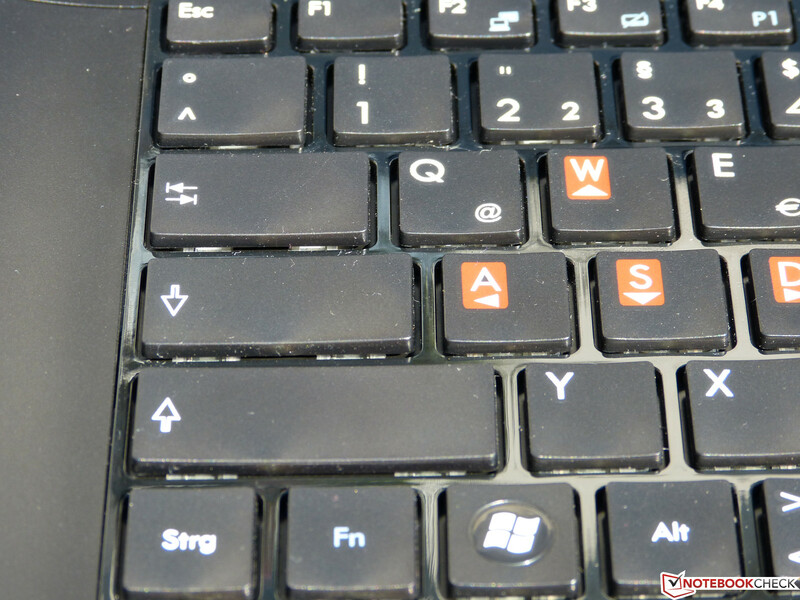 Also, the '>' key is moved to the left of the space bar. With this layout, gamers will first have to get used to the altered layout. It would have made a lot more sense to simply use a bigger keyboard. Since this notebook, as we have already mentioned, is based on a MSI Barebone, this problem also effects much of the competition. Unfortunately the touchpad does not quite win us over. It employs an acceptable, if not small touchpad. And we find that the mechanical buttons under the pad are quite rigid. To get movement on the screen you will have to apply relatively high pressure. 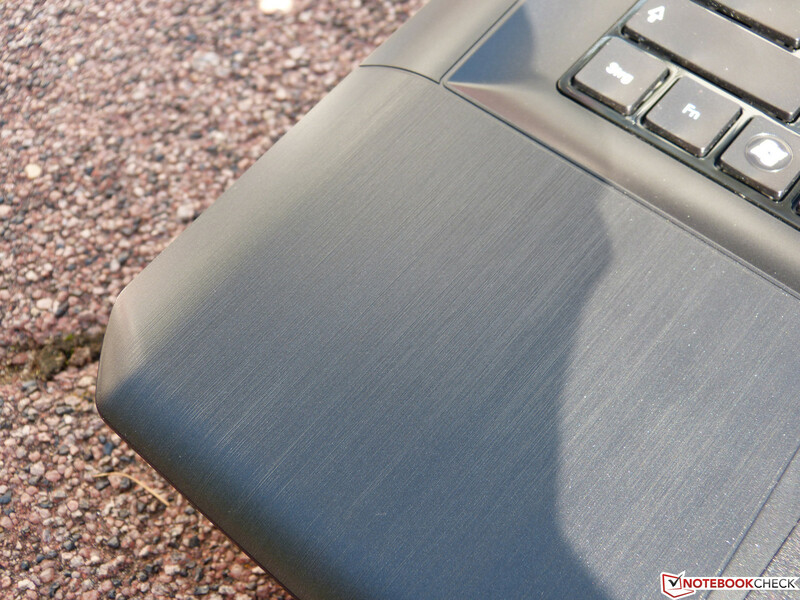 Aside from this the touchpad does respond well over the entire surface. The surface is slightly roughened, but still feels rather comfortable. Another negative point is that a single flick of your finger can send the pointer totally off the screen. Users will then have to locate the pointer all over again, which can get rather annoying after a while. The multi-touch functionality of the pad also had problems and wasn’t functioning on our test model, even though the software was not deactivated. Unfortunately Deviltech couldn't get us a suitable driver before our review deadline. The touchpad of the Barebone does of course support this function, so anyone interested in this feature will have to check our reviews of the previous generation. Just one look at the designated name of the display reveals that it is the barebone's typical, which should be recognized by a lot of people - the Chi Mei N173HGE-L11 display. 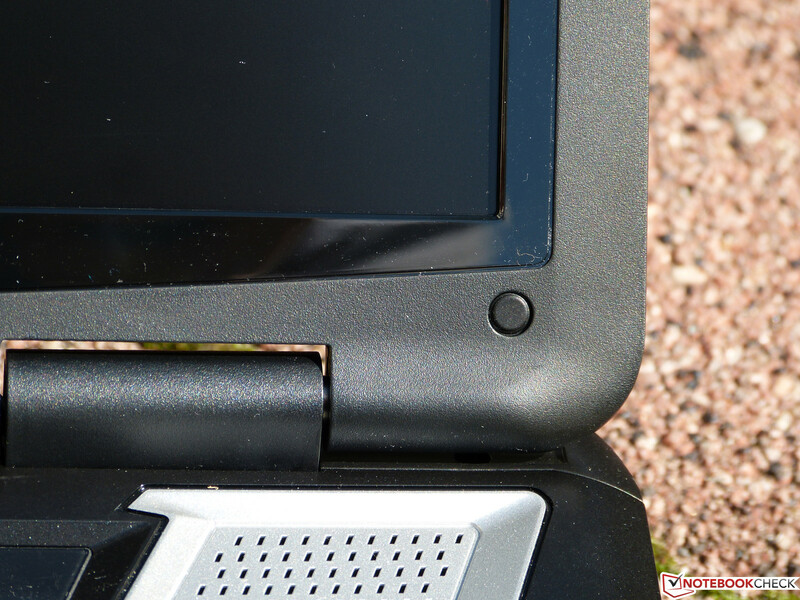 We have already measured above average test results in previous laptops. The Display is also utilized by the One M73-2N and the MSI GT70, with only the Erazer X7817 being different with an alternative from AUO. We will however also use the latter for comparing the results. 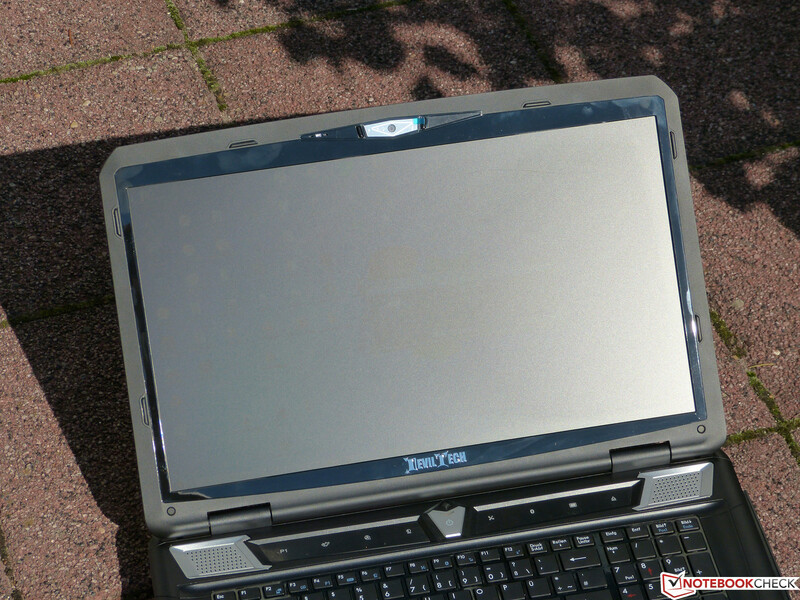 One big advantage of the screen is that the Chi Mei N173HGE-L11 has a matte surface. This means that annoying reflections, especially when outside, should be avoided. A second choice for configuring your display, like many other manufacturers offer, is not available for the Deviltech Fragbook in the online shop. The installed display presented itself as above average in previous tests, which we also found for our current test model. The black level score was low with a measurement 0.42 cd/m² meaning that blacks are not going to be shown as grey, but rather reproduced as actual black. The results for contrast were also pleasing to see, with 540:1 being a good value for this price range. The illumination is acceptable at 82%, but could be better. The values did startle us a little when they were compared with the other devices that use the same display. 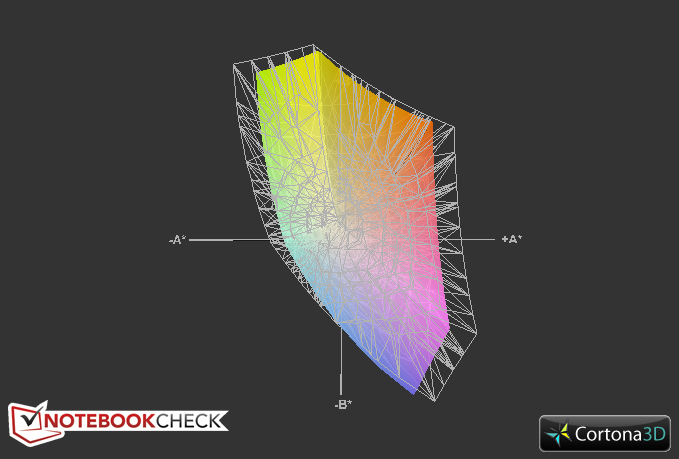 While using our Deviltech Fragbook we could only measure an average brightness of 216.4 cd/m², while the One M73-2N was a full 50 cd/m² higher in brightness. The contrast ratio also seemed to come in a bit low, with the MSI GT70 (also with the same display) measuring a pretty good 779:1 in this field. These different results are estimated to be a result of production variances as the displays all clearly carry the same name. However, we now need a comparison with the Medion Erazer X7817, which uses the AUO B173HW01-V5 display. 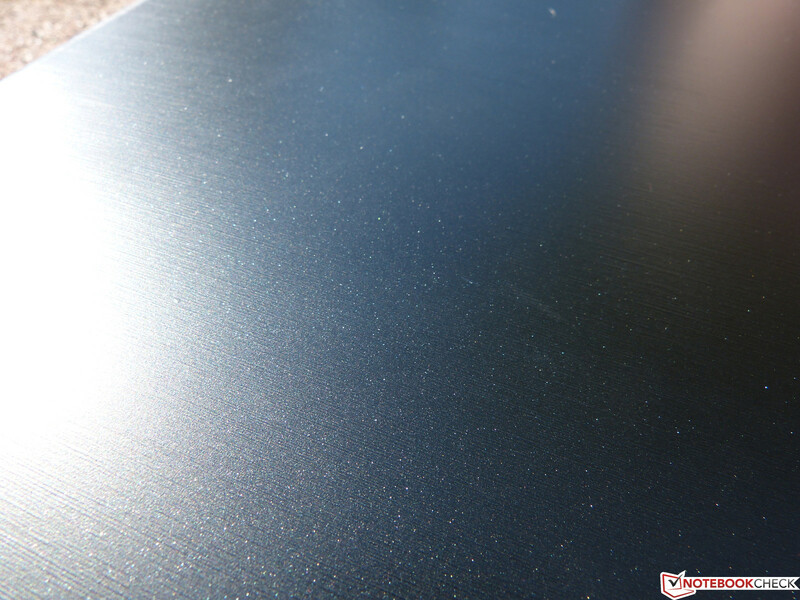 This is not only brighter than our model from Chi Mei, but also provides a higher contrast and a better black level. The illumination did fall behind with a reading of 74% when compared with our test model's 82%. Even if the color range is mainly just relevant in the field of professional graphics, we would still like to check the screen viability. The results are worse than we expected. While the AdobeRGB color spectrum is not reached, neither is the sRGB color range. Since those from the competition with the same display did manage to successfully cover the color space. We put the display up against the MSI GT70 which made for an interesting comparison. The suspicion that we may be testing a special display from a rogue product line is confirmed again here. The GT70 provides better color range than the Fragbook. While a matte display is the solution for undisturbed work outdoors, a display should also have a brightness somewhere over 200 cd/m². This is the case with our test model despite production variancies. Within our test of the Metro 2033 benchmark, the low luminance was generally clear to notice. Identifying objects in the dark tunnels was difficult and therefore caused unnecessary delay to the game flow. Therefore we conducted our test indoors (under bright lights) and not out on the balcony. So long as game scenes are designed brighter, there shouldn't be any problems with the display. 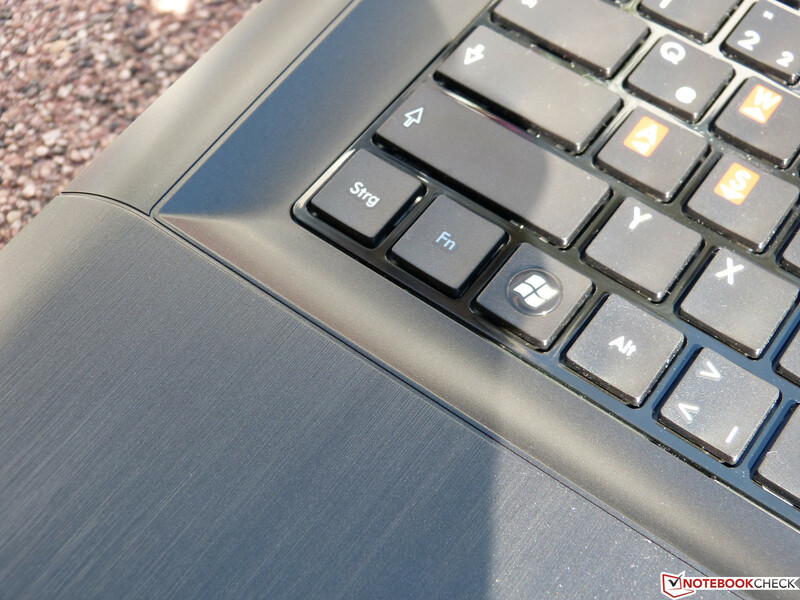 Despite a matte display, the gameplay is difficult to follow when direct sunlight or bright surroundings are a factor. Whoever happens to have an external (and bigger) monitor shouldn't be worrying to much about this stuff anyway. Besides the negatives, our special case Chi Mei Display with reduced brightness does have an important roll in our observations. 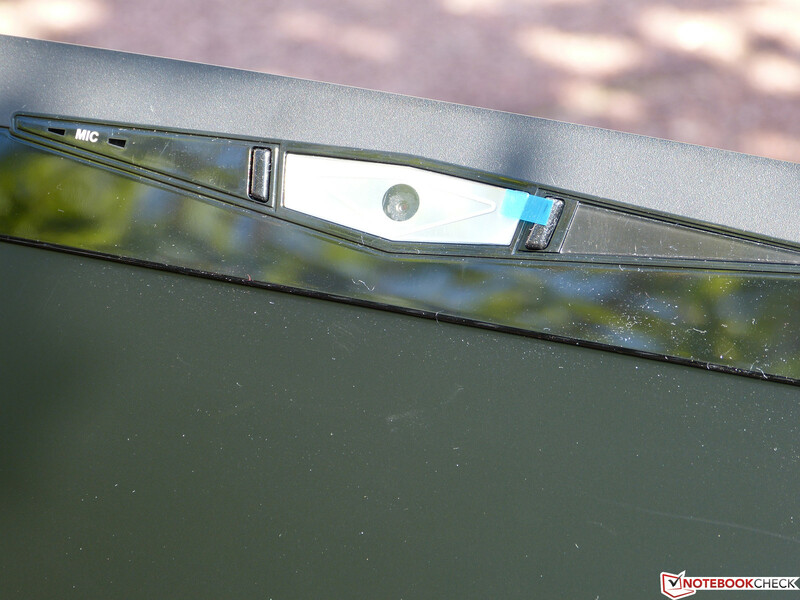 The display hinges hold the lid firmly in position and the viewing angles also give no reason to complain. In the horizontal viewing angle test, we could only see slight darkening on the left and right sides. 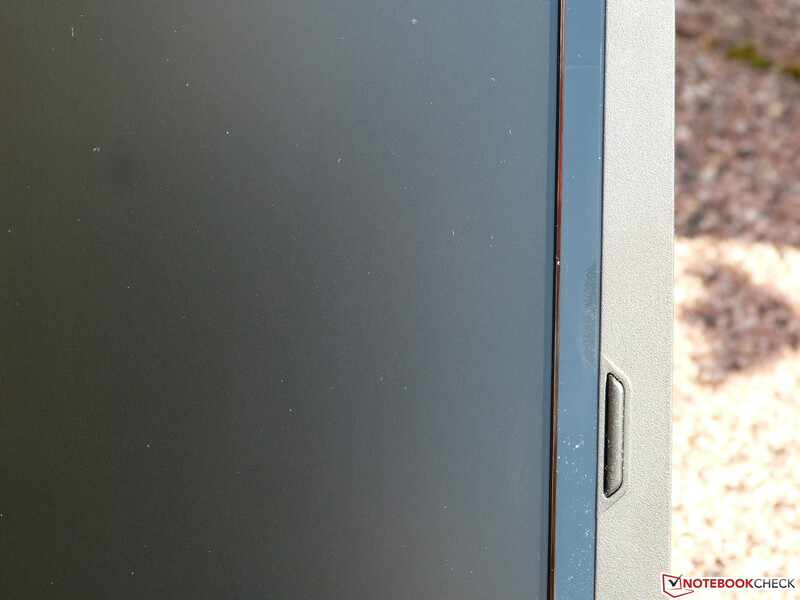 The vertical viewing angles are different. The colors start to invert after lowering the angle to 60 degrees although this is of course a position that nobody every sits with in daily gaming use. What is pleasing is the viewing angle from above. There is only a small color change noticeable. The brightness remains the same. 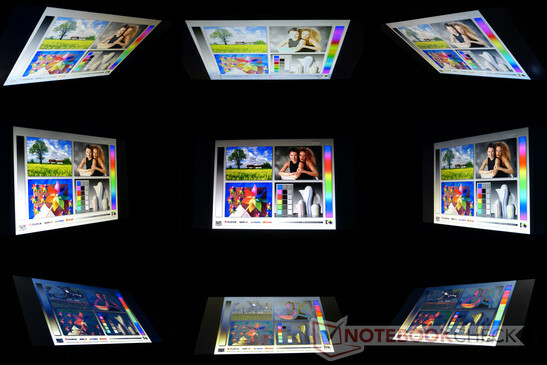 Overall, we are talking about a display with very good viewing angles. Our Deviltech Fragbook uses, as we have already mentioned, an Intel Core i7-3610QM, an Nvidia GeForce GTX 675M and 8 GB DDR3 RAM. With this configuration the test model should be able to deliver very good overall results and performance should be in the upper range of our benchmarks table. All of this does require an adequate cooling system which will avoid any throttling of the CPU and GPU, and also so that it can maximize its performance. Generally speaking, 8 GB of RAM should be enough for many users who now and then delve into video and photo editing, but more serious users will probably have to upgrade to 16 GB. For those who don't like doing upgrades themselves, the extra 8 GB (to bring the total to 16 GB) can be ordered online. Aside from the RAM, practically every component of the notebook can be swapped or upgraded on the Deviltech website. The manufacturer offers better processors, graphics cards and even Solid State Disks as upgrades. The installed CPU in the notebook is the 22nm-process produced Intel Core i7-3610QM. The TDP of 45 watts means that it can't claim to be an energy saver, but for this cost the processor does generally offer a lot of computing power. In Turbo Boost mode, one core of the CPU reaches up to 3.3 GHz, and 4 cores (8 threads) together are overclocked up to 3.1 GHz. The processor also provides good results in real practice. In Cinebench 10 32-bit, it scores 4479 points with single core use which puts it at the top position of all previously tested models with the 3610QM.In multi-core tests, the performance is in the upper bracket of the performance lists. The same applies in the 64-bit tests, where the single core results (5673 points) are lower than the ones of the processor in the Lenovo IdeaPad Y580. 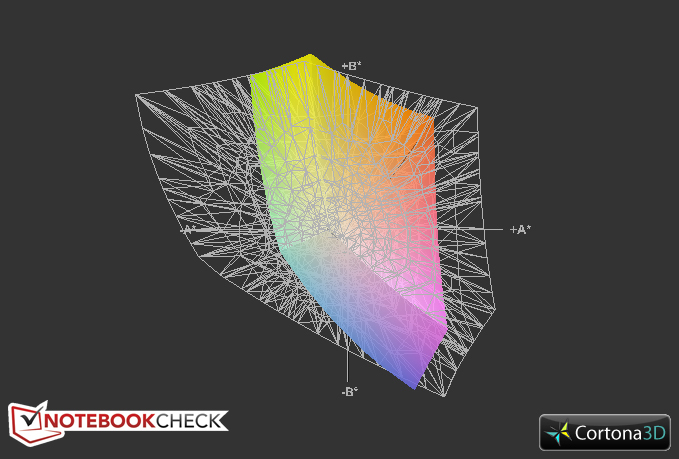 A similar result is reached by the notebook in Cinebench 11.5, where positions itself at the top of the heap. The performance is not the very best, but it still does produce satisfactory scores of 1.37 / 6.26 points (Single / Multi, 64-bit). Although under our stress test (see picture) there was a reduction of all four cores to 1.2 GHz, we can't really see this happening in daily use, or even in our gaming benchmarks. With the stress test the notebook is actually dealing with a situation that will not be replicated in a normal workload. So it is important for users to know that they don't have to worry about excessive throttling of the CPU. In both PCMark Vantage and PCMark 7, the system performance is average for its class (10160 / 2949 points). It is clear that the slowest component in our system is the hard drive. An SSD would not only raise the scores in the storage and productivity sections (PCMark 71823 / 1870 points), but also provide noticeable acceleration of the system in real use. We reach a similar conclusion when looking at PCMark Vantage, where the lowest scores are attributed to the HDD (5068 / 6108 points). But the hard drive does however perform better than expected. 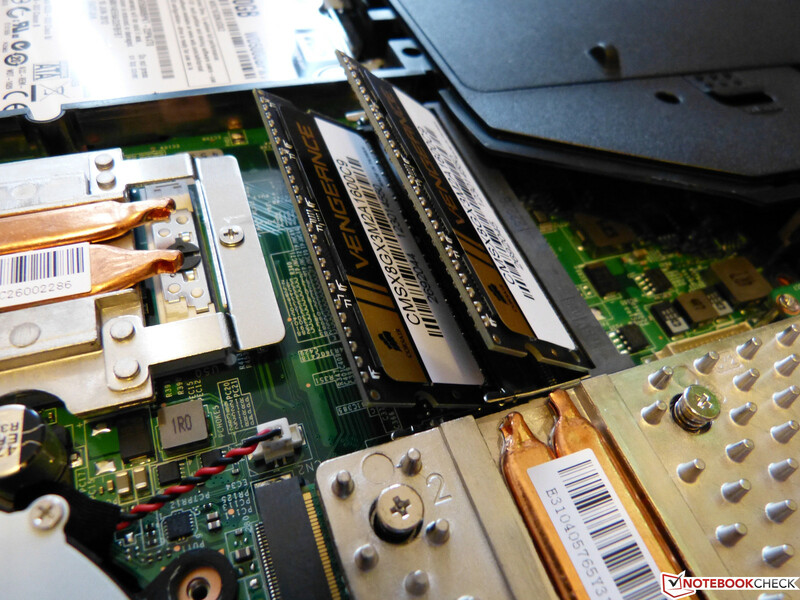 The introduction of SSDs is the only factor that can improve the performance of the laptop. 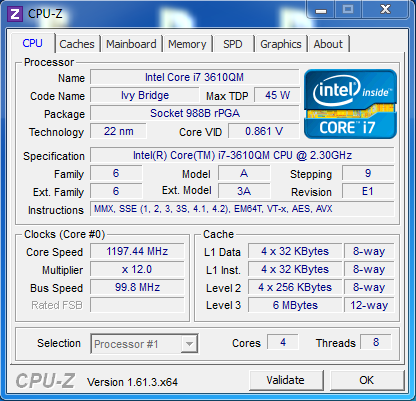 In comparison with other systems that have the same CPU and GPU, the Deviltech Fragbook is able to produce the same scores in PCMark 7 as well as PCMark Vantage. 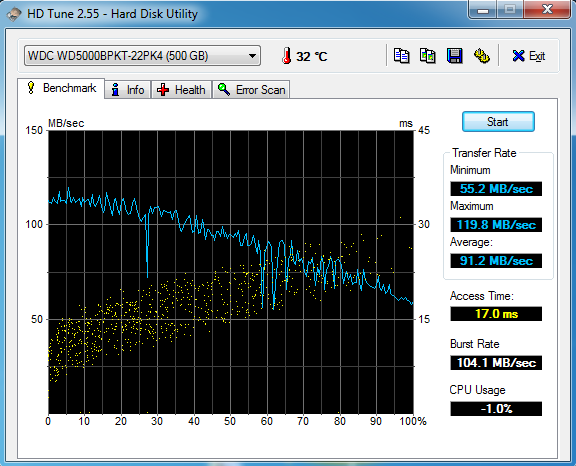 The 500 GB WDC Scorpio Black WD5000BPKT-22PK4T0 in the Deviltech Fragbook is a fast mechanical hard disk. When HDTune was run, the drive was able to reach a speed of 91.2 MB/s making it one of the fastest 7200 rpm drives on the market promising relatively fast loading times. These speeds are not comparable to any SSD. The access time are average measuring only 17 ms. CrystalDiskMark measures a sequential write value of 108.2 MB/s making this drive one of the fastest on the market today. Users who are looking for more performance should not shy away from buying a Solid State Disk. Thanks to the two hard drive slots, installing one yourself is really quite easy and promises clear performance improvements. It is not only the processor that is sitting on amazing performance potential, but also the graphics card. 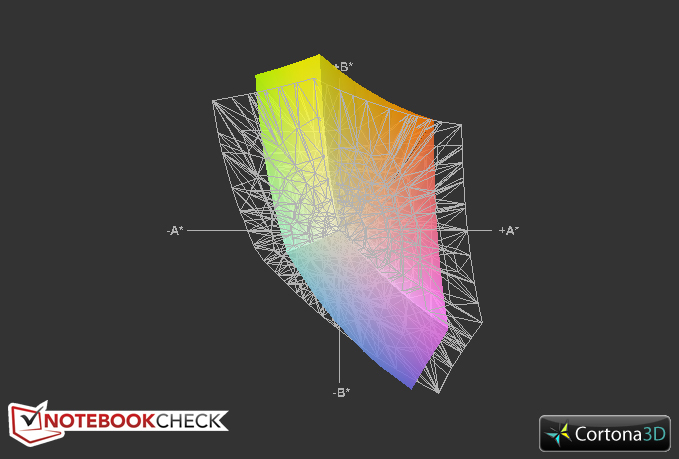 The Nvidia GeForce GTX 675M performs well scoring 3516 points in 3DMark11. Clearly more meaningful is the 3DMark06. With 20668 points, our notebook performance is slightly behind the Samsung Series 7 Gamer 700G7C (21012 points), which has the same configuration. A different picture is presented to us in the 3DMark Vantage. The card only reaches 13124 points here, and when compared to other notebooks using the Nvidia GeForce GTX 675M (Schenker XMG502 Pro: 13676 points, Samsung Series 7 Gamer 700G7C: 13707 Points) it finds itself well beaten in the performance stakes. 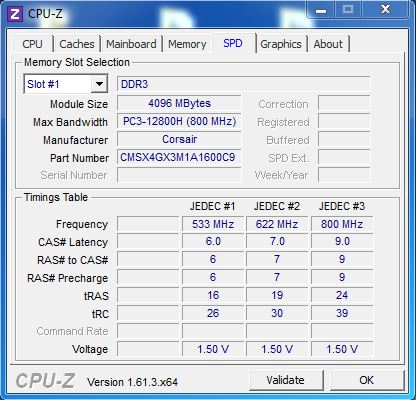 These results are often due to throttling of the graphics card, normally because of an excessively high temperature. In fact, the GPU throttled for a short time to 310 MHz during our stress test, when the temperature was closing in on the 96 degrees Celsius mark. It then returned to its original clock speed after a short period. These results were not generally reproducible. 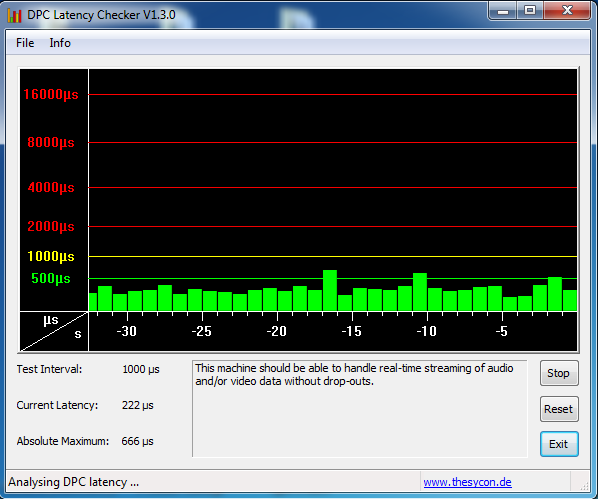 A second stress test at a later time clocked the card at 620 MHz with no hindrance and didn't lead to throttling. Carrying out the 3DMark 06 benchmark, we found clear signs of throttling which produced low results. In fact, the result was around 400 points under the result we got after a cold start with the notebook on the day before (20668 points). We checked if this type of throttling is observed during gaming, therefore, the gaming benchmarks are going to be exciting, especially when compared with similar laptops with the same or different configurations. Now on to what is most important for the laptop’s target audience – the Gaming benchmarks. The installed hardware has already promised good performance, but the question remains, especially in regards to current titles, whether they can be effectively played in ultra-high or at least high detail settings. We will find out if the throttling observed on the GPU directly affects the gaming results. We start by taking things slow. The racing game F1 2011 with minimal settings is still playable with the integrated Intel HD 4000. 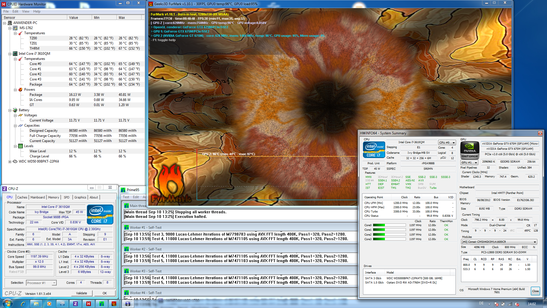 Therefore the GTX 675M can also run it problem free with these settings - 147 fps speaks for itself. With maximum settings the virtual racer still runs with an average of 47 fps and doesn't suffer from any lag. Piracy is not tolerated in the gaming industry. Nevertheless: The demanding (especially in high settings) Risen 2: Dark Waters still runs very smoothly with the GeForce GTX 675M. It is also important to note that our benchmark sequence is very hard on the GPU. Anyone who is not happy with even a single stutter will have to settle for 'just' the high detail setting. The benchmarks for Batman: Arkham City did suprise us. Despite an activated GTX 675M, full performance and CoolerBoost, the game did not want to achieve anything higher that 82 fps with minimal settings. 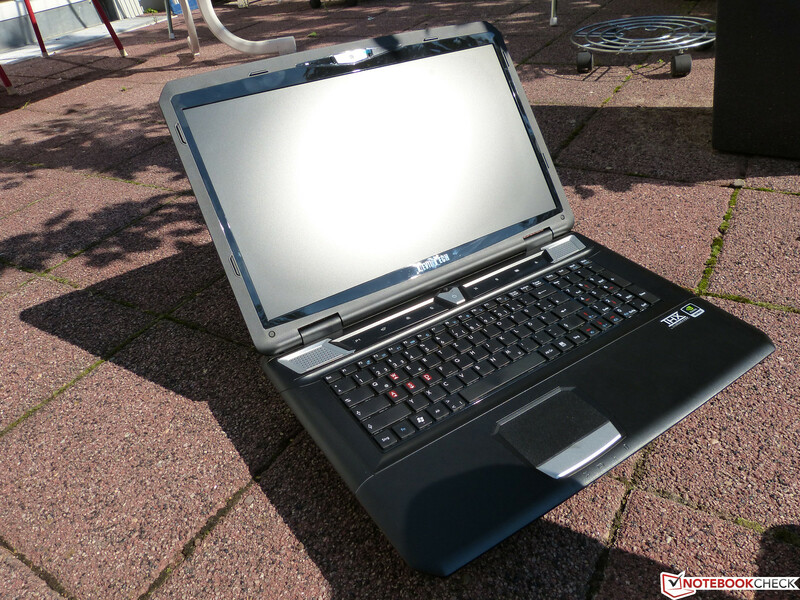 The Schenker XMG P702 Pro reached 138 fps in the same test. 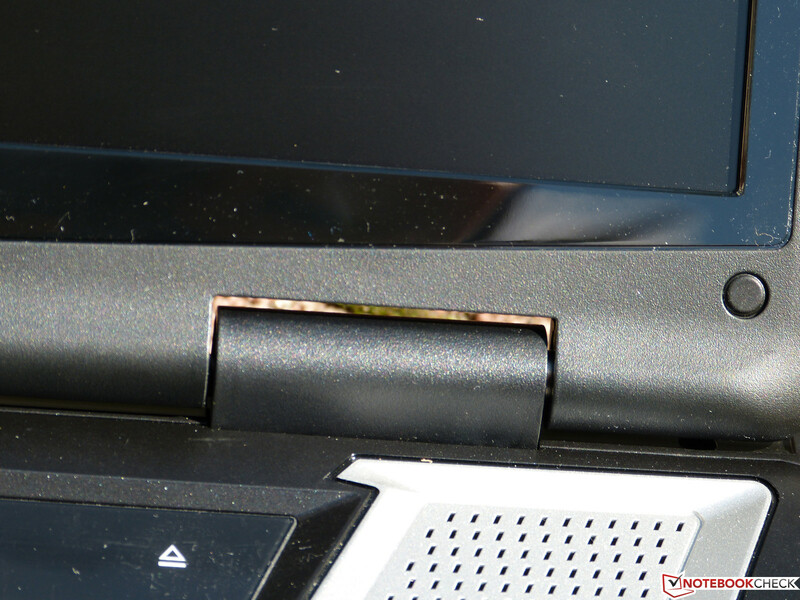 Under maximum settings this gap closes between the two notebooks. The game is not really playable anymore with 27 fps. Therefore, gamers will be forced to use high settings and fight crime in Arkham at 46 frames per second. At this point it should also be mentioned that Arkham City measurements are the only divergent values within our benchmarks. With minimum settings and a resolution of 1024x768 pixels, virtual soldiers march through the war zones of Battlefield 3 at 93 frames per second. It goes without saying that this doesn't quite fulfill the duties of a gaming notebook but what is interesting is the results for high and maximum settings. With the latter, the notebook has to wave a white flag reaching only 34 fps, meaning that you won't be getting much gaming fun at that speed. If you reduce the settings of the resolution, you get 53 fps (1366 x 768, u.a. 16x AF) with which you'll be able to hunt down the competition effectively and nothing in the virtual war should stand in your way. The gloomy atmosphere of Metro 2033 is not only demanding of gamers, but also of the hardware. Without a strong desktop graphics card or a mobile SLI solution, it is not really possible to run this game effectively with maximum settings. This is also true for the the Deviltech Fragbook. With 16 fps the game slowly mutates into a kind of slide show. With high settings the game runs more comfortably. Here we measured 47 fps which allows for smooth gameplay. The only real problem during this benchmark is the already mentioned, surprisingly dim display. The open world game Sleeping Dogs is seen as, with good reason, serious competition to GTA. Next to the impressive story are the impressive graphics. One big draw back has to be accounted for. Anyone wanting to enjoy the game with maximum settings needs access to a high performance graphics card. The GTX 675M is beaten here with producing only 15 fps, and should essentially be the same for the competition. Smoother gameplay is possible with high settings. The story of the Triads is explored at 55 fps with a little bit of power left in the tank. 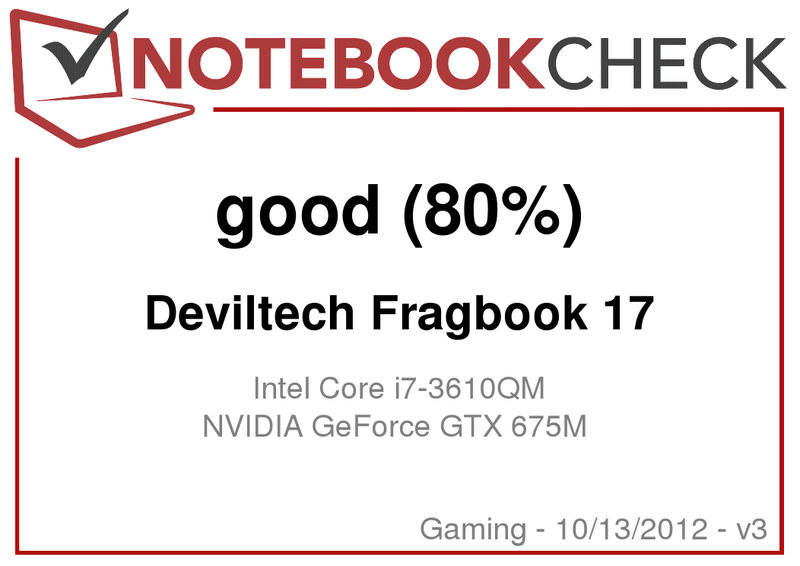 The throttling that came into play during our stress tests had no impact on normal gaming performance of the notebook. Minimum and medium settings were enough to achieve the necessary framerates for smooth gameplay. The performance of the card was similar to the others. Also, most new titles are usually played problem free on high settings. Slightly older games such as Skyrim can be played at maximum settings. For the price, the performance offered is definitely very good. As usual with gaming notebooks, the fan in the newest generation of Deviltech Fragbooks is anything but quiet. In idle mode, the fan is audible measuring 35.8 dB, but this isn't annoying. The noise from the hard drive and the DVD drive do add to the sound level producing an audible hum. Also, vibrations on the wrist rests, like with its predecessor, are no longer there. Under a heavy workload, the fan is clearly louder as we expected. 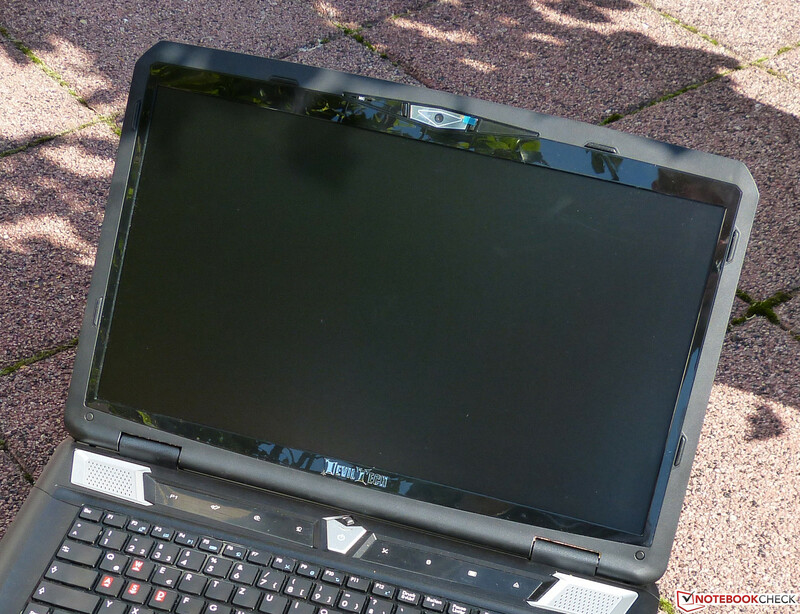 With CoolerBoost activated, the Notebook is more than audible and becomes annoying with a noise level of 51 dB. Quiet scenes in games are no longer enjoyable with all the other noise going on. Despite everything, there are no whining or other annoying sounds. The fan behavior is more or less balanced and doesn't undergo unnecessary fluctuations in speed. The relatively loud, but still effective fan has one deciding advantage. Under heavy stress and in idle mode, the case is kept effectively cool. It reaches a maximum surface temperature of only 44.5 °C (at the bottom) near the fan vents while under a heavy load. In other places it reaches between 24 and 32.3 °C, meaning the bottom is kept comfortably cool and the same goes for the top side. Also in idle mode, the surface temperature gives no reason to complain, staying between 23.2 and a maximum of 27.2 °C, which is well within the normal range. 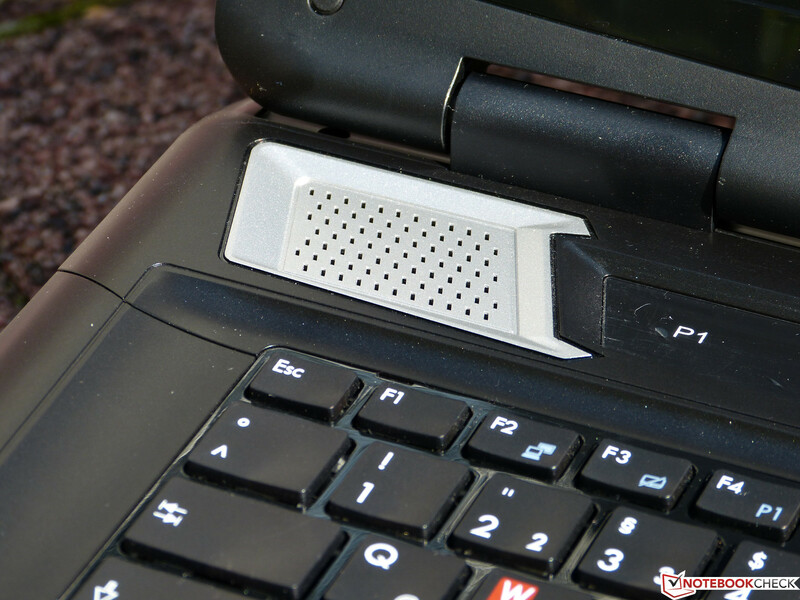 Of course the cooling system works at a loud volume to achieve this, but in return you have an effectively cooled laptop with the possibility of gaming with the notebook on your lap. (+) In idle usage, the average temperature for the upper side is 25.5 °C / 78 F, compared to the device average of 32.9 °C / 91 F.
(±) The average temperature of the palmrest area of similar devices was 28.7 °C / 83.7 F (+0.1 °C / 0.2 F). 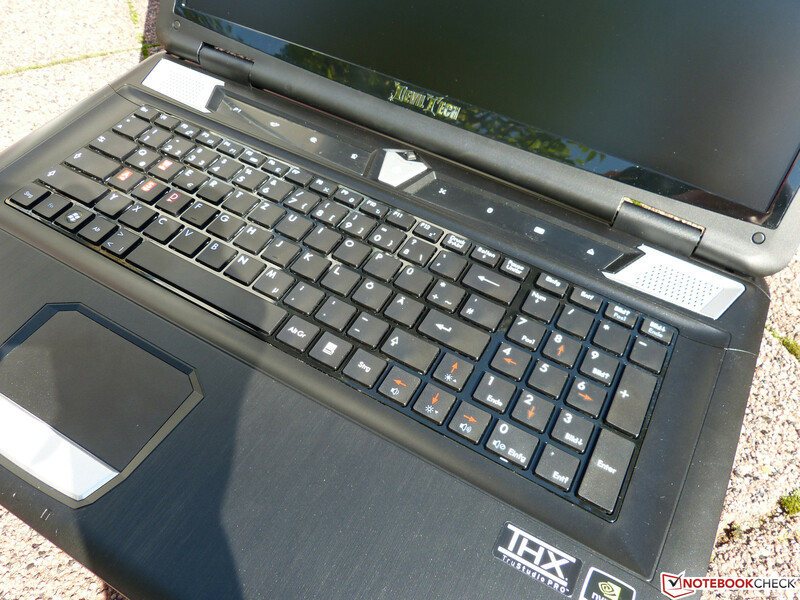 A special feature of the Deviltech Fragbook is the integrated 2.1 sound system, shown off with a "THX TruStudio Pro" sticker near the palm rests. You will find an additional sub-woofer at the bottom, which works along with the two stereo speakers in front of the display. In practice the system sounds clearly better than most notebook speakers, and even the maximum volume is not bad. But overall, especially when compared to a real sound system, the sound felt artificial and hollow. The bass could also be a bit stronger. Whoever really wants to enjoy crystal clear music should connect a proper sound system to the notebook, and thanks to the four jacks, this shouldn't be a problem at all. When you have a notebook with powerful hardware, you are also going to have to be able to live with the high power appetite when it is under stress. A minimum of 16.3 watts with deactivated WLAN, minimum brightness and energy saving profile may sound like a lot, but when compared with the Schenker XMG P502 and the Samsung Series 7 Gamer, which both had more than double consumption of 32.7 watts, this is pretty good. With maximum performance, the Deviltech Fragbook consumes 178.3 watts during our stress test, with CoolerBoost activated. 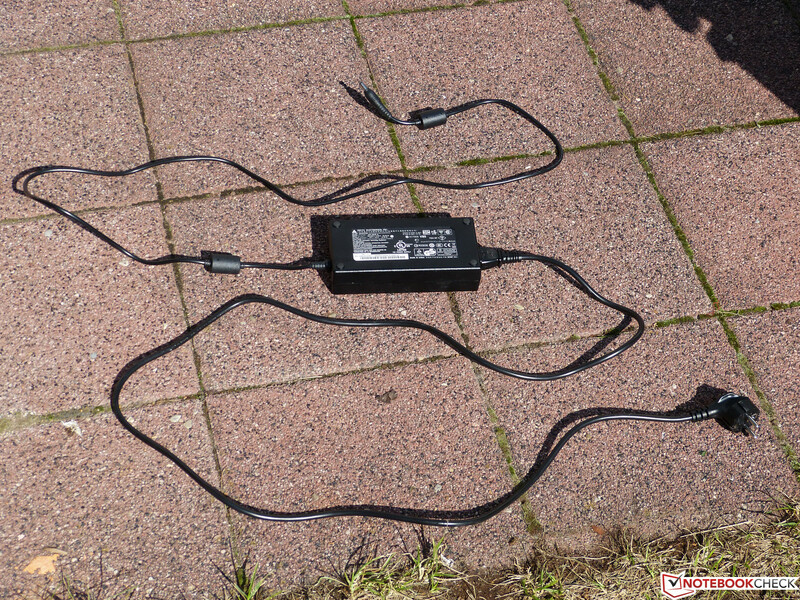 This means that the rather large 180 watt power supply was going to be pushed to its limits. In normal gaming use, you can expect a general power usage between 120 and 150 watts, which leaves room for improvement. Unfortunately the Deviltech Fragbook let us down a bit in the battery life test with our test model having battery problems. Windows advised us several times during our test to swap our battery despite it being charged to 100%, and after a few seconds without the external power supply, the charge dropped to 0%. Because of this it was difficult to measure the battery life. Our notebook lasted 193 minutes in our WLAN test, which does seem quite realistic with the installed hardware. When assigned to idle mode and viewing text documents under minimum brightness the notebook should last approximately 1 hour 30 minutes to about 2 hours, but this is simply an estimate. 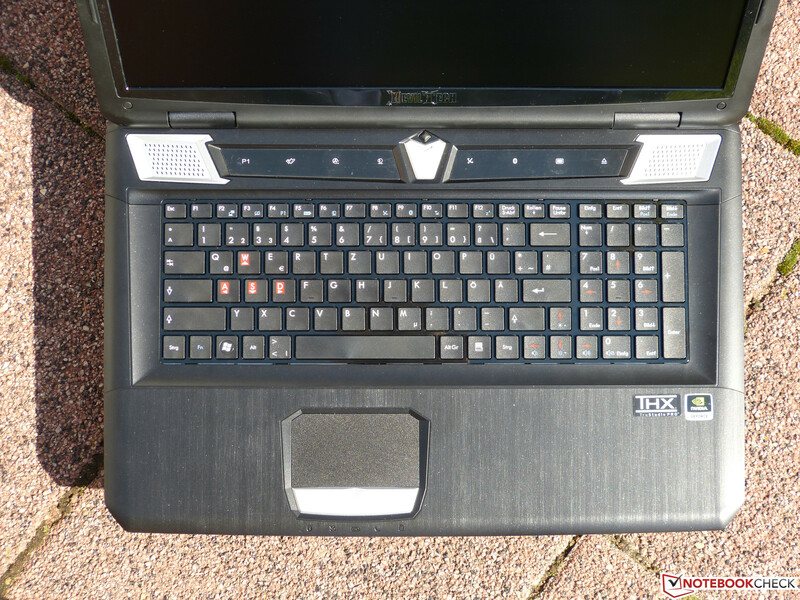 Under maximum performance, the laptop lasts for an hour and 8 minutes in standby mode. The previous version of the notebook managed a time of 1 hour and 3 minutes with 5 watts less power. Most gaming notebooks run for about half an hour longer, but around one hour is still an average result. Overall the battery life of the notebook is in the expected range. Deviltech has easily improved this in comparison with the predecessor. The problems with the battery should be easily fixable with a simple exchange. This problem should not occur with normal consumer sales and we suspect we had a defective battery, as similar cases are not really known. 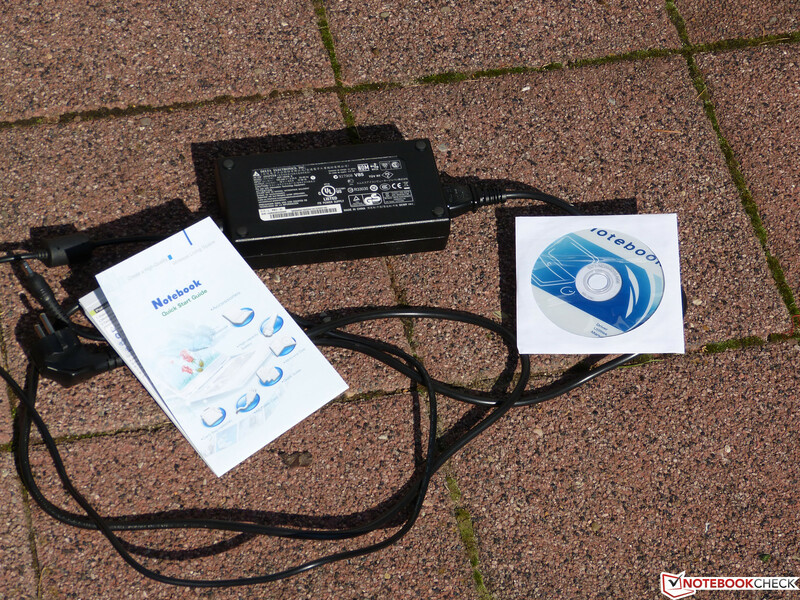 A battery swap before we needed to publish this article was sadly not possible. We didn't observe any ground breaking results during our tests. The Deviltech product is priced slightly higher than the direct competition with the GameStar Notebook Pro 17, which at 1300 Euro (~$1700) is about 50 Euro cheaper. While the notebook is essentially the same, Deviltech offers a 2 year warranty, while with the One, gamers will have to settle for a one year warranty. Anyone willing to lay down a bit more money (1800 Euro/ $2300), can also find themselves with the Samsung Series 7 Gamer and the Schenker XMG P702 Pro. For this price, you get not only an SSD, but a different design. The Deviltech Fragbook's design is a matter of taste. Blame lies surely on the quite chunky dimensions, which makes it end up with a weight of 3.7 kg. Now to the inner parts of the notebook. Despite some throttling during our stress tests, the 3610QM together with the GTX 675M provides good performance. Depending on the game, it surpassed its competition slightly, while staying behind in the 3DMark Vantage test. Anyone with a bit more money in their wallet should automatically upgrade to a solid state disk or simply order it with the notebook from the Deviltech online shop. Unfortunately during our tests we found three problems which shouldn't be allowed to pass on to customers. Firstly, there was the lack of the multi touch drivers which were also not to be found on the included back up CD. The other problems were to do with the display and the battery where the former can probably be attributed to production variancies with the display manufacturer, and the latter was simply a defect. The inbuilt sound system was not bad at all but it still couldn't really convince us that it was better than what was offered on the competition. Furthermore, the sound was partially hindered by the loud fan. People looking to play without headphones should eventually seek a quieter alternative. Despite everything, games on a limited budget should like the Fragbook as it provides a good price to performance ratio. The processing is solid and the display with a full HD resolution is big enough and more importantly matte. Which company the gamer eventually decides on is still up for grabs, but the configuration options in the online shop are worth a look. Update: Recently the Intel Core i7-3610QM has been removed from the Online shop. They have replaced it with the Intel Core i7-3630QM for the same price, which is only slightly different with about 100 MHz higher clock speed than the previously offered CPU. You can easily connect a better sound system. ...sub-woofer for an adequate, yet nevertheless artificial sound. ...are marked specifically for gamers. ...from the inside of the notebook. ...you will find a second empty slot in the case. ...is clearly drowned out by the fan. The bottom contains two slots for RAM, and another two are found under the keyboard. ...there is a good fan. 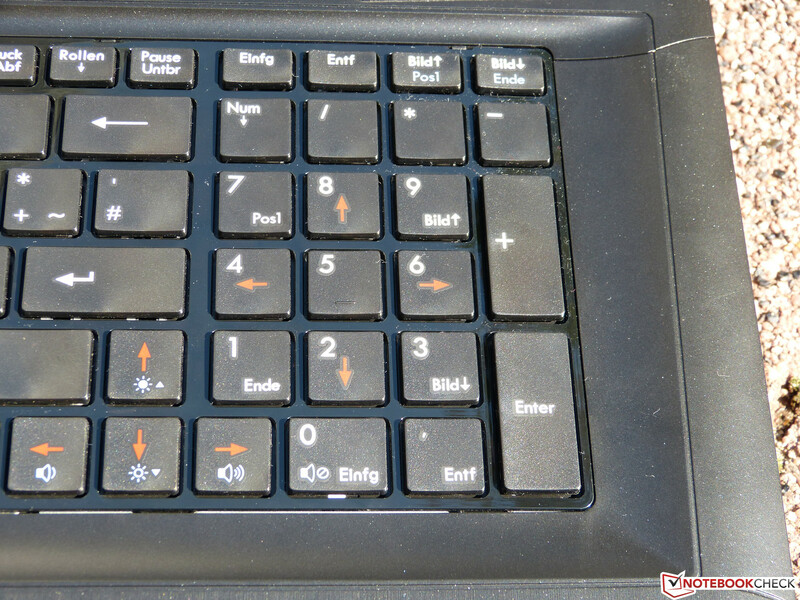 ...ugly and annoying keyboard layout changes. These design elements make the notebook look less monotonous. ...but the keyboard too is provided with a piano black finish. The palm rests are also made from plastic. ...plastic, which is textured on the top. ...is not everyone's cup of tea. ...you will find an integrated microphone. ...the nice feeling of typing is lost due to the stroke. ...when exposed to direct sunlight. Lots of performance for a relatively low price. The drivers for multi-touch functionality to make web surfing a bit more fun. Strong production variations with the screen - the average customer should expect a brighter screen. It is big and is currently sitting in this price range on effectively the same barebone. Bigger competition for 1300 Euro is the One GameStar Notebook Pro 17. For almost 1800 Euro (a bit too pricey) you can get an SSD with the Samsung Series 7 Gamer and the same goes for the Schenker XMG P702. Anyone still wanting a RAID-setup can look at the MSI GT70PH.